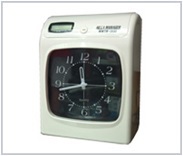 In regard to mechanical time clocks, this was accomplished by inserting a heavy paper card, called a time card, into a slot on the time clock. 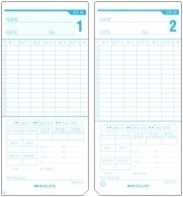 When the time card hit a contact at the rear of the slot, the machine would print day and time information (a timestamp) on the card. 3 kinds of pay period formats: Weekly, Bi-weekly or Monthly. 5 years of memory backup with a built-in lithium battery. 2 different day programs in a week. Printings in 2 colors (black/red)+symbols. 3 kinds of pay period format. Printing in regular minutes or 1/100th of hours. 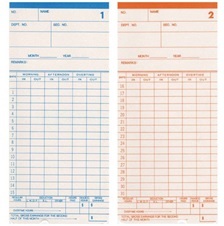 Angled insertion of the time card.